Lacey Chu has big dreams of working for the company behind the 'baku' - a customizable smart pet that functions as a phone but makes the perfect companion for its user. The only problem is, she's just been rejected from Profectus Academy - the elite academy for cutting-edge tech. Then Lacey meets Jinx... Jinx is an incredibly advanced cat baku who opens up a world that Lacey never new existed, including entry into the hallowed halls of Profectus. But what is Jinx, really? His abilities far surpass anything written into his coded. He seems to be more than just a robotic pet. 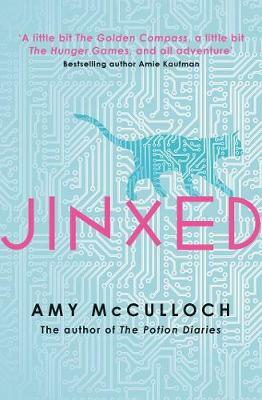 Amy McCulloch is the author of ‘The Potion Diaries’ series, which is one of my favourite Teen series, so I was very excited to read ‘Jinxed’. McCulloch has started strong with Jinxed, setting the scene with a Golden Compass styled future.